M. K. Herrington, Chief Boatswain's Mate, born Dec. 22, 1908, Delight, AR. 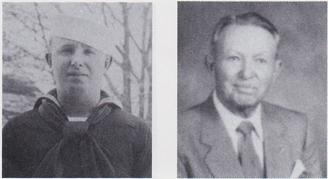 He joined the USN July 28, 1926, and served at NRS, Little Rock, AR; NTS, Hampton Roads, VA; USS Rochester, Richmond and West Virginia; NTS, Norfolk, VA; NRS, Cincinnati, OH; NATB, Solomons, MD; NATB, Fort Pierce, FL; NTS, Newport, RI; USS Guilford; NMWS, Yorktown, VA; and RS, NS, Norfolk, VA. Discharged Jan. 30, 1948, and retired June 17, 1956. His awards and decorations include the Good Conduct w/6 bars, American Defense, Asiatic-Pacific Area, Second Nicaraguan Campaign and the WWII Victory Medal. Married Vivian Elizabeth Mobley (deceased June 26,1978) and had three children: Sid, Jim and Vivian; five grandchildren and two step-grandchildren. His last employment was with Olin Mathieson Chemical Corp. as manager of anhydrous ammonia terminal in Joliet, IL, until his retirement in 1972. Herrington passed away Jan. 23, 1986.